Urethane Casting is most commonly used during the prototyping process, and can generally be expected to hold +/- .010” tolerances with +/-0.0015 in/in (parts larger than 20” may result in tolerances even beyond those stated). When multiple parts are needed, urethane casting can be used to fill the gap between prototype and production. Urethane prototypes can be of nearly any size and shape and can be color matched by either a pantone number or a color chip. Urethane Casting enables designers and engineers to get production-like material parts in their hands quickly, whether a company is in the midst of the prototyping phase of product development or needing finished looking parts for final tests and presentations. From models to prototypes for short-run applications like product trials, urethane casting is a great way to fabricate a low volume of parts that accurately mimic the color, texture, feel, and other physical properties achieved if it was an injection molded part. 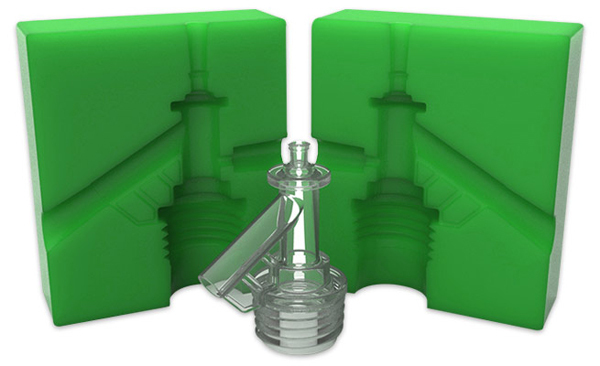 Because of the flexibility of the silicone, reverse draft, inserts and undercuts are more easily dealt with than in injection molding. Silicone molds are capable of reproducing incredible detail, including custom textures. Urethane casting provides fast turnaround. Our casting process is optimal for low-volume production for quantities of one to several hundred. On average, a silicone mold can accurately cast about 20-50 parts. The maximum quantity varies based on part design and material cast. At Jevny Prototypes, a prototype material can be chosen to match nearly any production material, from 5 shore A to 80 shore D. Some of the many materials that can be used are: two part thermoset urethanes, silicone rubber, wax and epoxies. Prototype materials and processes can simulate many of the thermoplastics’ characteristics of hardness, clarity, flexibility and impact resistance, giving you cast urethane prototype the same look and feel as a true production part. It depends on several factors, but a Urethane Casting mold typically yields 15 to 25 parts. One factor that may reduce the lifespan of a mold is the geometry—sharp edges or deep undercuts tend to deteriorate more quickly. 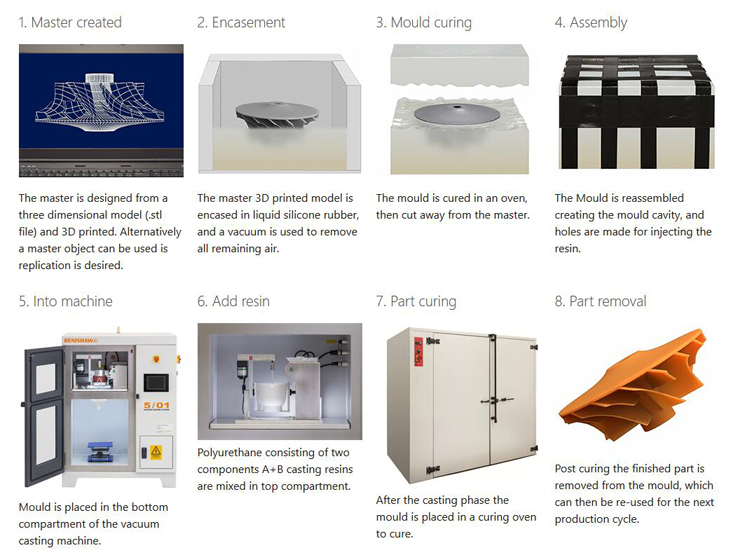 VolumeCast—a process that utilizes hybrid tooling and proprietary casting techniques—can have an extended mold life, up to between 35 and 75 units. How does the urethane casting process work? Whether you require inserts, over molding, copper shielding, molded in color/texture or painted in custom color/texture with applied graphics, Jevny urethane casting department will meet your required specifications. Get an Instant Quote for Urethane Casting!